The Scouts have a risky plan to defeat the Rod Reiss Titan. 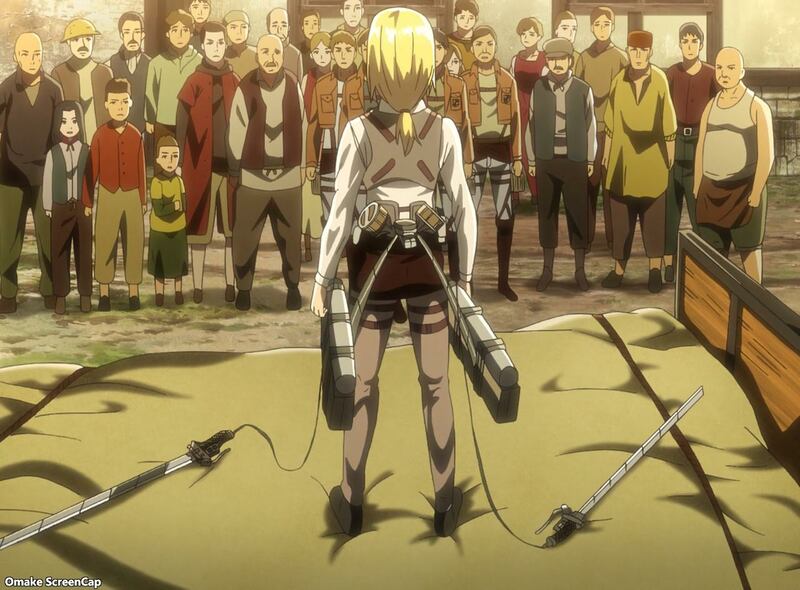 Historia joins the defense forces risking the life of the last royal heir. 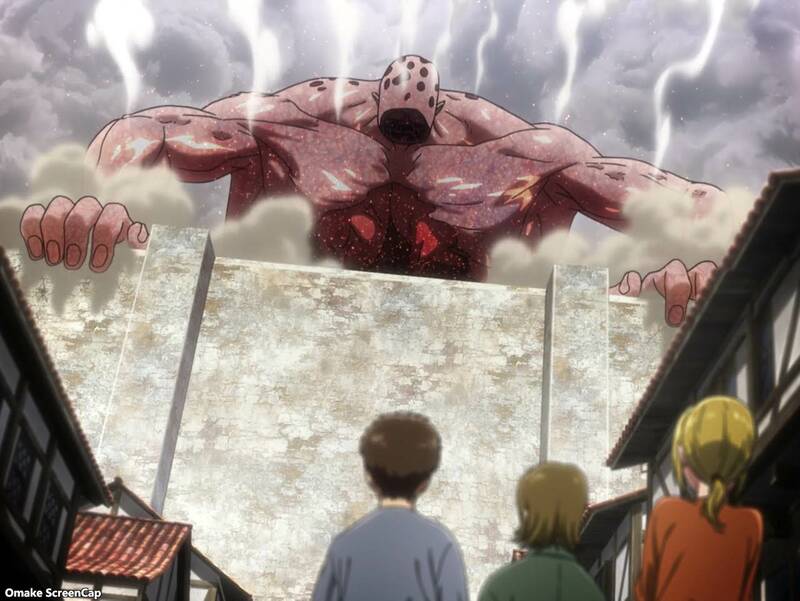 Episode 46 - "Ruler of the Walls"
I wonder if Rod knew he would become such a big Titan, which is why he told Historia that he couldn't (or shouldn't) take the serum himself. It's all moot now, since he became an Abnormal that ignored individual people and just swam along the ground to the nearest concentration of people. One thing I noticed in the dialogue was how quickly the story needed to get to the big action scene defending the city. In the past, the Scouts always used a lot words like "probably, most likely, theoretically, etc." when talking about their strategies for Titan operations. Here, everyone just knew Rod was attracted to a population density and that's why Erwin didn't want to evacuate the Orvud district. Also, the memories Rod "transferred" to Historia when she cut him up to defeat his Titan looked like they were flashbacks of part of the story that the anime didn't feel they needed to animate. The gist of the "First King's Will" was made through a lot of talking instead. I suppose these things were covered much more in the manga. Especially telling was Frieda's short scene where she said she wouldn't "succumb to the ghosts of the past." 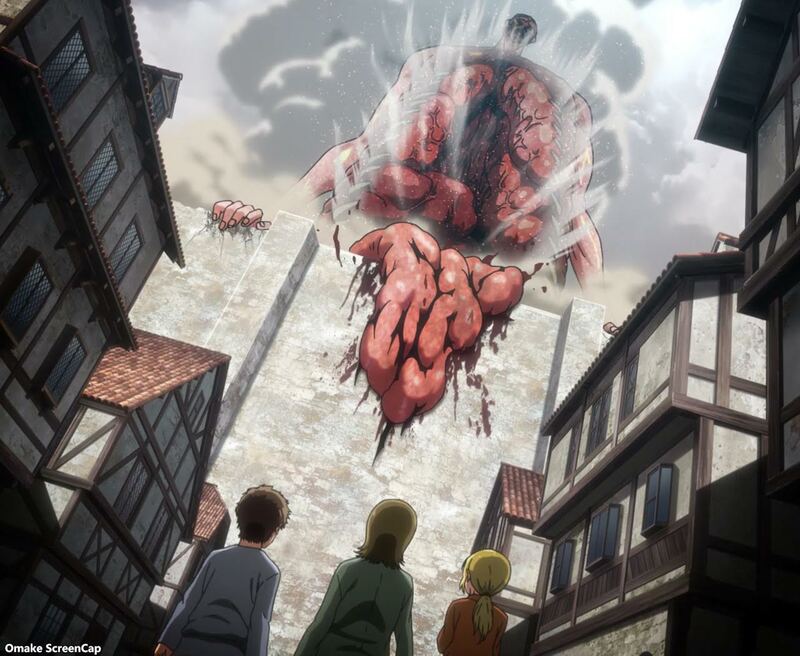 That still fits my theory of the memories of the entire royal line convincing the new successor to the Founding Titan to keep the people behind the walls harassed by Titans. For the anime, I think this was the correct choice. This story is supposed to be about the characters we see in the present day. The directorial choices of making the anime brutal, horrific, and full of decisive action would not fit getting bogged down with three episodes of flashbacks for characters we don't care about. Episodic television is all about seeing those characters every week. A long form novel is better suited for that long flashback of the previous generation of royal Titans. Plus, it looks like we'll see the more relevant portion of that story told through Kenny and Levi's eyes in the next episode. Erwin's face healed up pretty quickly after his trial. Hasn't it only been a day or two? That's an interesting view from the cockpit of the Rod Titan. People are like heat signatures and he's going after the greatest concentration. They say they tried to use Eren's Control to stop the Titan, but it didn't take. How do we know that Eren didn't just mess up again? These citizens seem pretty paranoid about this "emergency drill." Well, that coup did just happen, so mistrust of the military is understandable. Also, this northern part of the kingdom hardly sees any Titans. Northern troops have low Titan XP. Historia is settling into this role of the queen pretty quickly. Risking the last heir in battle is better than not building some kind of trust with the people first. Historia is a gambler like Erwin. Stop being such a crybaby Eren. Ha! Stop hitting yourself! It's not time to transform yet, Eren! Okay, it looks like Shouty McShouterson has got his game face on again. This is bad. The way the Rod Titan is crawling around, the cannons won't get a good shot at his nape until he's right at the wall. Bad luck. The wind shifted and now the cannons can't see where to aim. Oh. He can stand up. Ugh. He scraped away his entire front. That is disgusting. We're finally back to some real Attack on Titan stuff. This is some nice stirring music for Eren's hero operation. Erwin gambled on the Rod Titan shredding his face, and won. That is a spicy snack. Kaboom! Ooh, good thinking. The Scouts need to slice the bits that flew off the Titan to make sure the passenger is cut up too. Yeah! Go Historia! Rescue your people. They just might follow this Warrior Queen. Oh ho. Kenny survived, but he doesn't look too good. Time for some reminiscence. 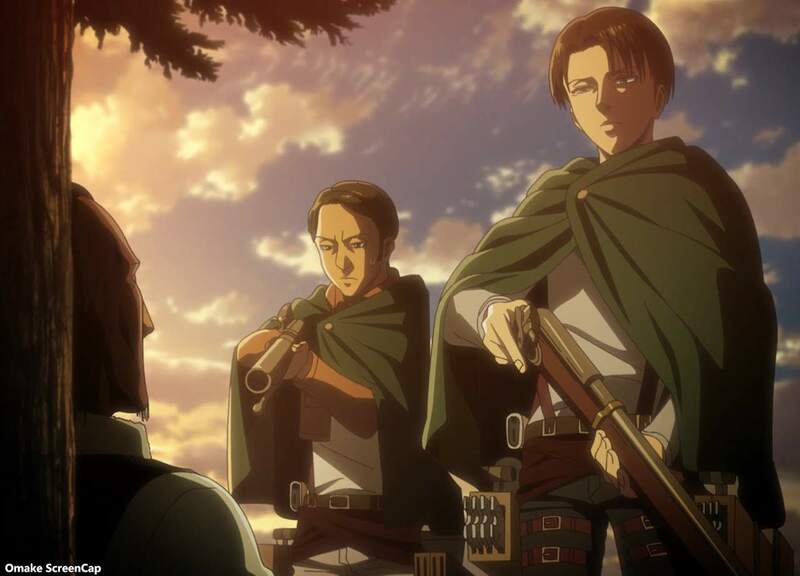 Levi looks like he wants to let him die quietly. Uh oh. Kenny has some Titan serum. He'd heal up, but he'd be a mindless Titan. I think he just wants to threaten Levi some more. This is a nice cliffhanger, regardless. Next time, Ackermann family secrets and why Kenny was so deferential to the King's family are revealed.